(1) Print this form (set printer to landscape mode first with .25'' margins in all directions). If possible, print on green-colored or Christmas paper. (2) On your printout, enter dates corresponding to the days of the month on the lines provided. 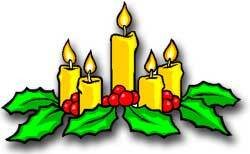 Note that Advent starts on a Sunday approximately 4 weeks before Christmas (the first Sunday of Advent may fall either in November or in December). (3) For each day of Advent, enter a special Advent activity. Enter activities to help you prepare for the celebration of the birth of or Lord such as saying special prayers, performing penitential acts, reading Holy Scripture related to the birth of Jesus, lighting an Advent candle, assisting a neighbor, visiting the Blessed Sacrament, etc. Tip: Refer to www.MyCatholicSource.com / www.CatholicCommunityCenter.com for additional ideas. (4) Each day, complete your Advent activity and cross off items completed.